Why I don't think Bitcoin and Cryptocurrencies are in a bubble. According to analysts, we are in a "secular bull market". "Raymond James believes there may be nearly a decade left in this secular bull market, which is defined as a market that's driven by forces that could be in place for years. 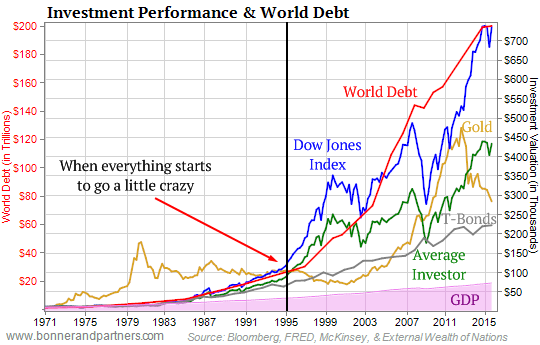 It's not to say that there can't be corrections or even a bear market along the way. But he said the secular bull should prevail." all the assets are in a bull market: stocks (S&P 500, Dow Jones), Nikkei index (Asia/Japan), Commodities, crypto-currencies, the Euro vs Dollar, Chinese Yuan vs Dollar, etc. Jeff Saut: "This is going to be the longest, strongest secular bull market of my career and I've been in the business 47 years." So if you insist, you can say the entire financial system is in a huge bubble. In this case why should I care that Bitcoin is in a bubble? Until now all the asset classes are highly correlated in long term. For this reason common sense tells me that if at some point the bubble will burst, the entire bubble will burst, unless the correlation will change. The blockchain and the cryptocurrencies trend is building something much more important than wealth; It is a brand new technology with huge potential both technically and socially. The blockchain is here to stay.